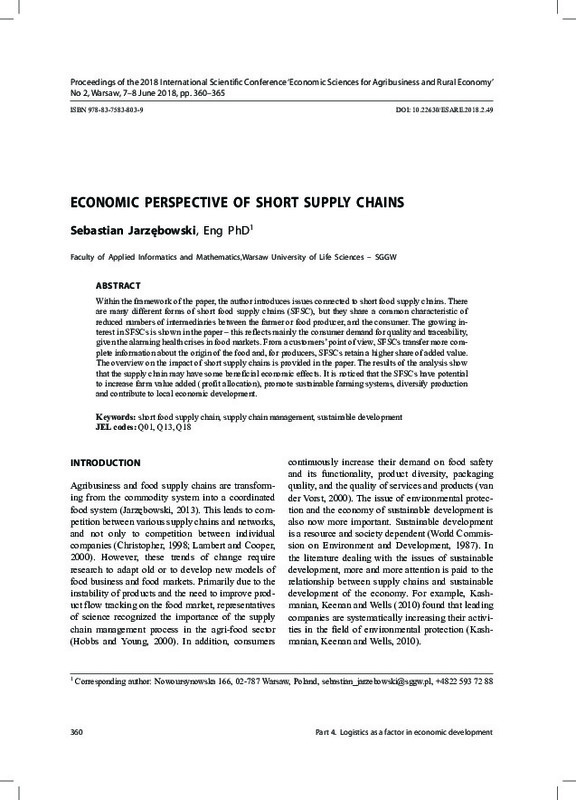 Within the framework of the paper, the author introduces issues connected to short food supply chains. There are many different forms of short food supply chains (SFSC), but they share a common characteristic of reduced numbers of intermediaries between the farmer or food producer, and the consumer. The growing interest in SFSCs is shown in the paper – this reflects mainly the consumer demand for quality and traceability, given the alarming health crises in food markets. From a customers’ point of view, SFSCs transfer more complete information about the origin of the food and, for producers, SFSCs retain a higher share of added value. The overview on the impact of short supply chains is provided in the paper. The results of the analysis show that the supply chain may have some beneficial economic effects. It is noticed that the SFSCs have potential to increase farm value added (profit allocation), promote sustainable farming systems, diversify production and contribute to local economic development.